1. Manisha Ma Bhairava worships the Goddess and engages in Tantric ceremonies in Tarapith, in Bengal. She did not want to sleep with her husband, and when she was forced into his bedroom she was possessed by the Goddess and had a fit. For years she kept going into trances. Her husband beat her. She ran away and slept in the temple. From that day, her trances became less frequent. She left her home and her three daughters to join the Tantrics. Her devotees filled the place in her heart that her children had occupied. 2. Lal Peri is a devotee of the Sufi saint Lal Shahbaz Qalander. She was driven first out of India into East Pakistan and then out of East Pakistan into Sindh. When her father died, she took refuge in the shrines of Sindh and struggled to live as a Sufi in Pakistan. Dalrymple says she "was an illiterate, simple and trusting woman, who saw the divine and miraculous everywhere." But her Sufis ran into Wahhabi Muslims, who blew up the shrines, silenced the music, and persecuted the women. 3. Tashi Passang lives as a Tibetan monk in Dharamsala, in India. He fought against the Chinese after they invaded Tibet and killed his mother. He tries to justify his violence by evoking Buddhist scriptures: "In certain circumstances it can be right to kill a person, if your intention is to stop that person from committing a serious sin. You can choose to take upon yourself the bad karma of a violent act in order to save that person from a much worse sin." He says, "I have prayed for the souls of the men I have killed, and asked that they have good rebirth." 4. Hari Das is possessed nightly by a god during a cycle of theyyam ritual performances every winter in Kerala. He is a Dalit (or Untouchable) and works as a well-digger and as a prison warder. During the season when the god possessed him, he says, "though we are all Dalits even the most bigoted and casteist Namboodiri Brahmins worship us, and queue up to touch our feet." He sees the theyyam as a weapon of resistance against an unjust social system. 5. Rani Bai is a sacred prostitute (a devadasi) in a town in northern Karnataka. She services eight or ten customers a day. Her parents sold her when she was six. Her daughter died of AIDS, and she herself is now HIV-positive. Very poor, and very pious, women see the devadasi system as "providing a way out of poverty while gaining access to the blessings of the gods". Unlike other women, a devadasi can inherit her father's property. 6. Kanai is a blind minstrel who sings with the Bauls ("crazies"), an antinomian sect, at Kenduli, in West Bengal. When he was six months old, he caught smallpox and went blind. When he was ten his brother was killed in an accident, and when he was eleven, his father died. His sister hanged herself. The deaths drove him "mad with grief". Unable to remain in the village, he remembered a Baul guru whom he had met and joined the Bauls. After a song, Kanai says, "It makes us so happy that we don’t remember what sadness is." 7. Mataji wanders as a member of a sect of Digambara ("sky-clad" or naked) Jains at Sravanabelgola. He came from a well-to-do Jain family and met a holy man one day: "I was very impressed ... I decided I wanted to be like him ... I was only sad that I had already wasted so much of my life." 8. Mohan was a low-caste singer of the epics of the cavalier hero and deity Pabuji in Rajasthan. He died of leukaemia when no hospital would treat him or even give him a painkiller. 9. Srikanda Stpathy is a Brahmin idol-maker in the temple town of Swamimalai in South India. His chief sorrow is that his son wants to become a computer engineer instead of carrying on the family tradition. Dalrymple leaves the reader with an overwhelming sense of sadness. As he admits in the introduction, he roots many of the stories "in the darker and less romantic sides of modern Indian life". But he also says: "There is a palpable sense of community among the vulnerable outcasts, lunatics and misfits [who] are here venerated and respected as enlightened lunatics full of crazy wisdom." Christian missionaries, together with colonial scholars and administrators, dubbed India's overlapping religious traditions "Hinduism" in the late 18th century. The polyphonic quality of Indian religions is largely due to the original influence of Hinduism. Hinduism has ingested and modified innumerable folk religions since its origins in the Vedic religion of North India's Aryan settlers. Early in its millennia-long presence in the Indian subcontinent, Islam lost its Arabian austerity, mingling with local religious traditions to become something that Wahhabis would abhor. Much of the subcontinent’s composite culture has survived both the divide-and-rule strategies of British colonialism and the rivalry between the nation-states of India and Pakistan, which has produced three major wars since 1947. Religious piety in India continues to grow, even as religion, along with caste and language, has assumed an aggressive and divisive new role in mass electoral politics. But while the politics of religion becomes more vicious, a vast majority of the subcontinent's population quietly go on with their personal and syncretic religious practice. Most secular Europeans assumed that it was only a matter of time before religion in India was expelled from the public sphere and banished to the darker corners of private life. They had not reckoned with the fact that religion in India was a whole way of relating to the world and offered a set of ethical parameters for everyday life. William Dalrymple conceived the idea for Nine Lives on a pilgrimage to Kedernath. The book is often very moving in its first-person accounts of spiritually-minded people that Dalrymple meets on his travels across the subcontinent. 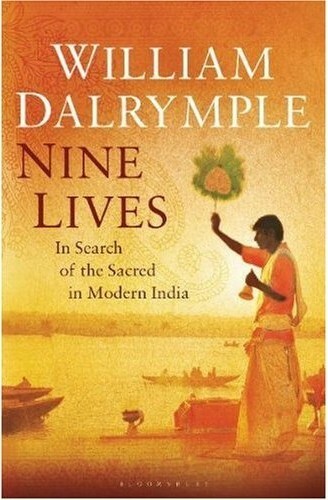 Dalrymple raises some large questions in his introduction: "What does it actually mean to be a holy man or a Jain nun, a mystic or a tantric seeking salvation on the roads of modern India, as the Tata trucks thunder past? How is each specific religious path surviving the changes India is currently undergoing? What changes and what remains the same? Does India still offer any sort of real spiritual alternative to materialism, or is it now just another fast developing satrap of the wider capitalist world?" The true vitality and continuity of Indian religions is still to be found where most of India's population lives. Still widely practised, folk religions and pluralist traditions constitute the norm rather than the exception. In South India, Dalrymple writes, "every village is believed to be host to a numberless pantheon of sprites and godlings, tree spirits and snake gods, who are said to guard and regulate the ebb and flow of daily life." The impersonal authority of science and the modern state doesn't much impress people for whom traditional religions remain a vital source of ethical and pluralist worldviews. Mohandas Gandhi, the most famous and creative Hindu of the contemporary era, borrowed from Islam and Christianity in an effort to infuse mass politics, and contemporary life in general, with ethical urgencies. The self in Indian culture is not something clearly defined or enclosed. The sharp disjunctions and separations that define identities in even the most liberal and multicultural Western nation-states rarely occur here. This idea of the self makes space for an irrepressible spirit of accommodation and fellow-feeling. India's pluralism would be impossible without the moral and spiritual core of traditional religions. AR Reading this stuff after recently rescreening Michael Wood's BBC documentary series on India gives me a visceral sense of the visceral stuff of India. It's a blend of fascination and horror. India is transforming itself at breakneck speed. According to CIA estimates, the Indian economy is expected to overtake that of the United States by roughly 2050. These huge earthquakes have affected the diverse religious traditions of South Asia. Modernization within India is destroying the local and varied flavors of Hinduism. Taking their place is what eminent Indian historian Romila Thapar calls "syndicated Hinduism." Hinduism has no founder and no one founding text. Indeed, the idea that Hinduism constitutes a single religious system dates only from the arrival of the British in Bengal in the eighteenth century. Early colonial scholars organized the disparate, overlapping multiplicity of non-Abrahamic religious practices, cults, myths, festivals and rival deities that they encountered across South Asia into a new world religion that they dubbed "Hinduism." Hinduism has slowly become systemized into a relatively centralized nationalist ideology that now increasingly resembles the very different structures of the Semitic religions. Thapar writes: "The model is in fact that of Islam and Christianity." According to Thapar, this homogenizing process is now accelerating as a new middle class has created a desire for a "uniform, monolithic Hinduism, created to serve its new requirements." Across the subcontinent, faith has been growing and religion becoming stronger as the region reinvents itself. In nineteenth-century Europe, industrialization and the mass migrations from farms and villages to the towns and cities went hand in hand with the death of God: organized religion began to decline and the church and state moved further and further apart. The experience of South Asia has been more or less the reverse of this. Religion and politics are becoming ever more closely entangled. The infiltration of religion into Indian politics is something for which the nominally secular Congress is as much responsible as the overtly Hindu nationalist Bharatiya Janata Party (BJP). There has been a dramatic increase in state funding for yagnas (fire sacrifices), yoga camps and temple tourism, as well as a dramatic increase of state land allocated to temples, ashrams and training schools for temple priests. Hinduism is not the only religion in South Asia suffering from standardization. In Pakistan, the cults of local Sufi saints are losing ground to a more standardized, middle-class, and textual form of Islam, imported from the Gulf and propagated by the Wahhabis, Deobandis, and Tablighis in their madrassas. Today, the great Sufi shrines of the region find themselves in a position much like that of the great sculptured cathedrals and saints' tombs of northern Europe five hundred years ago. Reformers and puritans are on the rise in South Asia, distrustful of music, images, festivals, and shrines. As in Europe, they look to the text alone for authority, and recruit the bulk of their supporters from the newly literate urban middle class. Religiously conservative Hindus and Muslims both suffered the humiliation of Western subjugation. In both faiths, reform movements reexamined and reinvented their religions in reaction to the experience of failure and conquest. Hindu reformers tried to modernize their diverse spectrum of theologies and cults under the influence of Western Christianity. Islamic radicals opted to return to what they saw as their pure Islamic roots. If you would know Allah, go to the infinite blue. Who is this you call Allah? We all know this to be the truth. Be it Hindu, Muslim, Jewish or Christian! Lalon, knowing this, wanders happily in woods and forests.